Will my hand activate the chain brake during each time kickback happens? Will inertia activate chain brake each time kickback occurs? No, it won’t. In order for inertia activating the chain brake the kick back force needs to be high enough, otherwise chain brake would be activated very often and chainsaw normal operation would be very little. Will my chain brake each time protect me from kickback caused injury? No, it won’t. In order for chain brake to activate it needs to be strong enough and the bar mustn’t be to close to you. Only proper working technique can minimize or/and eliminate kickbacks. How does the throttle lockout work? How does the chain catcher work? The chain catcher is built to catch the chain when it jumps off or snaps. When chain is properly tensioned it should never happen. How will you know that the chain should be replaced? What is the purpose of the right hand guard? The right hand guard stops twigs and branches from interfering with your grip on the rear handle and protects your hand if the chain jumps or snaps. What vibration damping system is for? What stop switch is being used for? What muffler is being used for? How to properly sharpen cutting teeth? To sharpen cutting teeth use a file gauge round file. Switch off the engine as shown on the picture number 29. Verify if chain is well tensioned. Reduce the pressure on the return stroke. File cutting teeth from the inside face. File all the teeth on one side first, then turn the chain saw over and file the teeth on the other side. File all the teeth to the same length. During sharpening the file must be positioned so as determine the following three corners of the cutting: “A” upper angle 30° – 35° “B” external side angle 85° – 90° “C” internal side angle 60° 2. The file must be positioned and must work perpendicularly to the bar. In order to achieve very precise side angles position the file so that you vertically cross over the cutting edge of about 0,5 mm. Sharpen all the teeth of one side first then turn the saw over and repeat the operation. To obtain a uniform cutting surface in the wood, all the teeth must be sharpened to the same length. Pay attention not to reduce the size of the cutting teeth below 4 mm, if that is your case you need to replace the chain with a new one. How to verify that my chain is well tensioned? How to adjust the depth gauge? How to lubricate my chainsaw? You should lubricate your chainsaw with a good chain oil for both safety and comfort needs. McCulloch recommends universal vegetable biodegradable oil for outdoor chains- there is one McCulloch is producing. In instances when the universal outdoor accessories chain oil is not available, standard chain oil is recommended. What petrol should I use for my chainsaw? What oil should I use for my chainsaw? McCulloch chainsaws require two-stroke universal outdoor oil. Mixing ratio should be (3%) 1:33 with oils class ISO or JASO formulated for air-cooled, two-stroke engines and (2%) 1:50 with Universal Outdoor Accessories two-stroke oil. How to tank my chainsaw? How should I transport and store my McCulloch chainsaw? How to start my chainsaw? 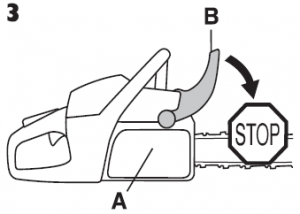 How to stop my chainsaw? 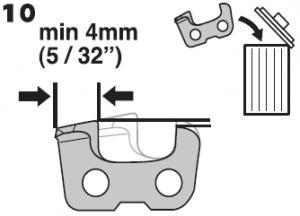 How to extend life-cycle of my chainsaw? How to check the brake trigger? How to check Mc Culloch chainsaw oil level? In McCulloch chainsaws fuel runs out before the saw chain oil, whenever there is enough fuel and chain oil the the tanks. Chain lubrication should also be verified each time you refuel. The tip of the bar should be aimed at a light coloured surface around 20 cm away. 1 minute later you should run your chainsaw at 3/4 throttle and then you see light line of oil on the light surface. If that is not the case you will need to verify if there is no obstruction at the oil channel present in the bar, alternatively you will need to verify that the edge of the bar is clean. When after cleaning all mentioned before chainsaw is still not working properly you should take your equipment into the nearest McCulloch service station. How to fit a spike bumper? The spike bumper is factory fitted on most McCulloch chainsaws and should be replaced only in the servicing stations.